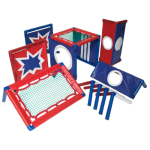 The complete Core Skills Set allows for the creation of a multi skills circuit of activity in the indoor or outdoor based learning environment as shown in the examples below. We took the ECB Cricket Factory Rig and a Bannerzone to the London Soccer Dome to support a corporate family cricket festival featuring the England Squad. The children were given the opportunity to work with the players on all aspects of the game. We were lucky enough to have Mike Yardy work with us throughout the evening on the Cricket Factory Core Skills Set! We were very excited when approached by Richard to supply him with various items of the Cricket Factory for use with the England Squad. Richard Halsall, England Fielding Coach.